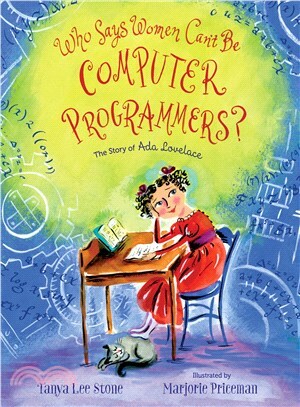 A picture book biography of Ada Lovelace, the woman recognized today as history’s first computer programmer—she imagined them 100 years before they existed! In the early nineteenth century lived Ada Byron: a young girl with a wild and wonderful imagination. The daughter of internationally acclaimed poet Lord Byron, Ada was tutored in science and mathematics from a very early age. But Ada’s imagination was never meant to be tamed and, armed with the fundamentals of math and engineering, she came into her own as a woman of ideas—equal parts mathematician and philosopher. From her whimsical beginnings as a gifted child to her most sophisticated notes on Charles Babbage’s Analytical Engine, this book celebrates the woman recognized today as the first computer programmer. Tanya Lee Stone loves to write about women pushing boundaries. She is the award-winning author of The House that Jane Built, Who Said Women Can't Be Doctors?, and Elizabeth Leads the Way. She lives in Burlington, Vermont. Marjorie Priceman has twice received Caldecott Honors, one for her illustrations in Zin! Zin! Zin! A Violin! and one for Hot Air: The (Mostly) True Story of the First Hot-Air Balloon Ride. She is the illustrator of Who Said Women Can't Be Doctors? by Tanya Lee Stone. She lives in Lewisburg, Pennsylvania.